Darrielle & Jobit are Fun In The Sun Weddings’ newest newlyweds! This bride and groom are the perfect testaments that getting married the way YOU want to will leave you the happiest in the end. Darrielle & Jobit have actually known each other since they were kids, but it wasn’t until Darrielle’s last year of high school that they really started connecting. Darrielle is friends with Jobit’s cousin, and at one of his family reunions they started to get to know each other better, and have been inseparable ever since. Being strongly attached to their families, it made perfect sense for Jobit to include her family in his proposal. At a New Years day dinner, after her grandmother finished saying grace, Darrielle looked up to find Jobit down on one knee with a ring. He asked her to marry him in front of her whole family! Awwww! Darrielle was so excited that she bought her wedding dress before they even started planning! She bought it because she loved it and didn’t care what kind of venue she would be wearing it at. The couple began their plans for a traditional Filipino wedding because of course, that’s what would please their parents. Growing up, they felt like they didn’t have much of a choice in how they would get married. But Darrielle and Jobit are non-traditional, private people, and the idea of getting married in front of 500 to 600 people made them sadly start to loathe the idea of having a wedding at all! The big traditional wedding just didn’t feel right for them. So they started talking about a small intimate wedding, one in a beautiful country where their families would be able to relax together. And then they began to get excited. And the more they thought about a planning a destination wedding in Mexico, the more confident they became that they could get married the way they wanted! Of course, their families did not share their excitement about getting married on the beach. So they found a compromise that would make everybody happy. 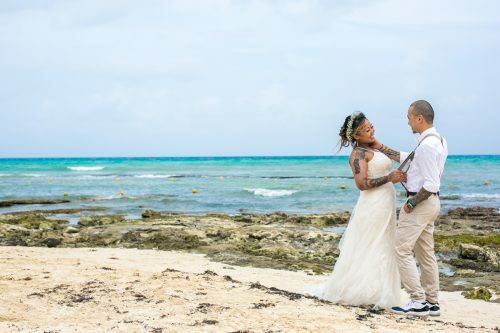 Darrielle & Jobit would get legally married in a small Catholic ceremony in Canada before having their symbolic wedding at Sandos Caracol Eco Resort in the Riviera Maya. 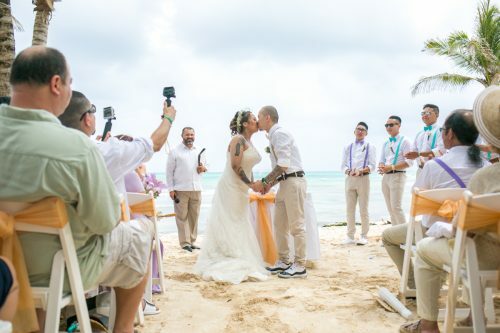 They embraced everything about having a beach wedding, from a bright color palette of turquoise and lavender to wearing barefoot sandals and carrying bamboo paper umbrellas. And they did a sand ceremony, which was Darrielle’s favorite moment of the day, because of the significance of the combining of sands. Their wedding exceeded their expectations, and they are so happy with how it all turned out. What advice does our bride have for all brides getting married on the beach? Stay calm! It doesn’t matter what type of wedding you’re planning, destination or traditional, or anything in between, because it doesn’t do anyone any good if you’re always in some sort of panic – least of all, yourself. 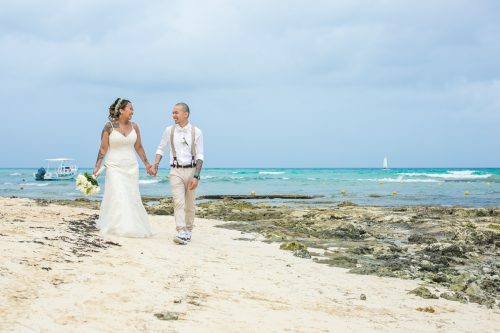 Darrielle and Jobit, we are so happy that you chose to follow your own path and get married in Playa del Carmen, because it gave us the opportunity to work with you! It has been a true pleasure, and we wish you nothing but the best as you start this new chapter of your lives together. Congratulations! Want to know more about Sandos Caracol Eco Resort? Read unbiased reviews on Tripadvisor here. Working with Gillian was such a breeze, she was such a delight, and made everything so simple and easy! Marc was just as kind and reassuring. He was easy-going, accommodating, and a pleasure to work with. Thank you for capturing these unforgettable moments for us - and so beautifully!